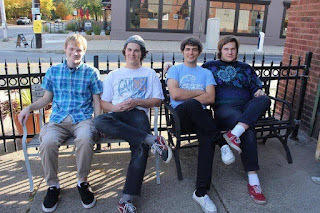 Creative Nonfiction/Essay By Alex Beckman of Video Grave: "The Making of a Band"
Video Grave evolved from a shared passion for music. Alex Beckman and his childhood friend, Patrick Maloney, loved hanging out in Patrick’s basement listening to songs and finding new bands. One day it occurred to them that they could start their own band. Alex learned to play the guitar and Pat learned to play the guitar and drums. After a couple months of practice they asked their good friend Spencer Hartford to join as their lead singer. It was Alex on guitar, Pat on drums, and Spencer singing. Soon after they stopped covering songs and started to write their own. Patrick started playing guitar and Reid Markus filled in on drums. There was a spark. Immediately, they had this connection with one another. It was almost telepathic. Maybe it was from their similar interest in music or just the fact that they were all best friends, but something just felt right and they ran with it. 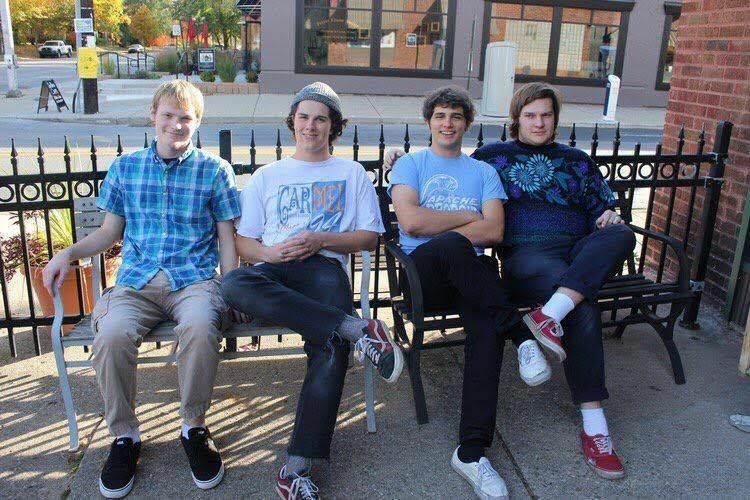 Still, to this day, it is just those four; Spencer on lead vocals, Patrick lead guitar, Reid on drums, and Alex on rhythm guitar and back-up vocals. They are currently recording our first full length record and it should be out by Spring of 2016. Below, Alex speaks to his influences, the creative process and his approach to lyrics. His lyrics are what resonated with me the most. They are powerful and tell a story in a way that so many modern songs do not. I was in second grade when my father took me to my first concert. That was the moment I knew I wanted to make music for the rest of my life. I took guitar lessons right after that show. I only stuck with it for about a year before I quit because it was too hard for my seven-year-old self but I still knew all I wanted to do was make music. Whenever people would ask me what I wanted to do when I grew up I would always say, “I don’t know,” but I knew I wanted to play music. I guess it just seemed like a hefty dream and I was kind of embarrassed to say that is what I wanted to do when I was taking none of the needed steps to reach my goal. In my heart I knew one day I would learn an instrument and start to make music. So that day in the basement, when Patrick and I decided to start a band and learn the instruments, I took it to heart. I spent countless hours in my bedroom trying to teach myself the basic chords or attempting to learn songs that only consisted of three chords. Ever since I have been able to play guitar I have written my own songs; however, it was not until the summer before my freshman year of college that I found myself writing songs that I was actually proud of. I was starting to write songs that had better stories or had more emotional ties than the songs I had written previously. When I write my songs, I always take a little different approach. I always strive for my lyrics to be the best part of my songs. As a listener and consumer of music, many of my favorite bands have songs with lyrics that paint a clear picture but still allows my mind to create a story in my head. Artists like John Darnielle of the Mountain Goats, Connor Oberst of The Bright Eyes, Brian Sella of the Front Bottoms, Paul Westerberg of The Replacements, Andrew Savage of Parquet Courts, Gareth David of Los Campesinos!, and Patrick Stickles of Titus Andronicus are writers I strive to be like. I want my songs to have a story that people can relate to, but each song means something different to everyone that hears it. I want my songs to have meaning. I want my songs to make people think and to make people feel for something that doesn’t affect them. I wrote this song about leaving a very good and very close friend. I saw a tear form in her eye and that image imprinted itself in my brain and it is an image I cannot shake. The second stanza is me reacting to her lashing out because she is hurt. She made a comment that I had no emotion, which wasn’t true, I just didn’t know what to do with my face or my body. I was frozen. The mention of a sunset tree is actually an allusion to the Mountain Goats record, Sunset Tree. This was not an easy record for John Darnielle to make, but I like to think that it helped bring him peace, so that is where the character in this song went, under a sunset tree. Sitting there represents a place of hurt and pain but hope to work through it. The last stanza of this song is basically saying that the narrator of this song won’t kill the main character, or be the death of her unless she chooses that to be so. So she can now only be hurt by the narrator if she chooses to. When writing this song, I took a different approach. I envisioned a story in my mind and I tried to bring it to song. The first half of the song is all about some of the horrible but true facts of life. The layout of the song is like two people sharing drinks and maybe reading a newspaper or something of that nature. They are talking about multiple stories or circumstances that are currently happening somewhere in the world. The first chorus is these people kind of shaking off these horrible stories and saying cheers to us for living in this corrupt world. I picture the second half of the song as another person who knows someone that is struggling firsthand. He knows more in depth the problems this person is facing, selling her wedding ring so she can feed her kids. The end of this song kind of leaves you with hope. I did this because I realized that a lot of my songs had sad endings, so I wanted to give this character in particular hope.